M Vijay’s Test career seemed done and dusted when he was dropped – first from the XI and then from the squad – after his pair at Lord’s during the England tour. A quick dash to county where he scored heaps of runs, and the failures of KL Rahul and Shikhar Dhawan handed him a lifeline for the Australia tour. Even then, the sight of Rahul and Prithvi Shaw opening in the only tour game made it clear he was only the third choice opener. That’s when Vijay received another lifeline, through Shaw’s injury. Vijay got a chance in the second innings, and responded with a century, sealing his place for the first Test in Adelaide. Two innings into his comeback, Vijay has wasted his lifelines with scores of 11 and 18. What’s more disappointing from an Indian perspective is the manner of his dismissals – edging Mitchell Starc behind the stumps driving loosely on both occasions. It’s an extension of the mode of dismissals that led to Vijay’s axing from the squad. For a batsman who was hailed for leaving well, Vijay’s dismissals show an uncertainty in knowledge of where his off-stump is. Since the tour of South Africa, Vijay has no half-century in 12 overseas innings. His highest score is 46 in the second Test in South Africa, although the 25 (127) in the following Test on a breaking pitch was an invaluable knock. In five of those 12 innings, including twice in this Test, Vijay has fallen edging while driving or tamely poking outside his off-stump. Conditions over the last one year have been tough – and sometimes even extreme – for batting, but it’s also true that the very foundation of his success overseas seems to be breaking. Interestingly, it’s not like Vijay is getting out very early into his innings. Only twice has he been dismissed within ten balls into his innings, both at Lord’s when he bagged a pair. He has played at least 15 balls in each of the remaining ten innings, and more than 100 balls twice. Vijay is getting out constantly just around the time he should be settling down. That was the case yet again in the second innings in Adelaide. Vijay battled for 18 off 53 balls, doing everything the way he would on his good days. He left well, battled through some testing spells, played a couple of nice looking drives. And then did something he has been doing over the last one year – fish outside off and edge. It was similar to the way he fell in the first innings too. Starc had set him up brilliantly then - bowling a few short ones before luring him with a full ball. To be fair to Vijay, the shot was on, but his feet just didn’t move. In the second innings, Australia’s pacers tried getting him leg before, bowling a lot of inswingers that targeted his pad. Vijay survived a couple of lbw appeals, but perhaps it kept playing in his mind. He ended up chasing one that was angled across – once again without footwork - and fell in a now familiar manner. It all started with a change in technique in South Africa, where Vijay introduced a shuffle towards the off-stump into his game. It was quite surprising, for he already seemed a batsman who knew exactly where his off-stump was. He shed the shuffle before England, but he still hasn’t found his off-stump. Are these mid-innings dismissals just lapses in concentration? 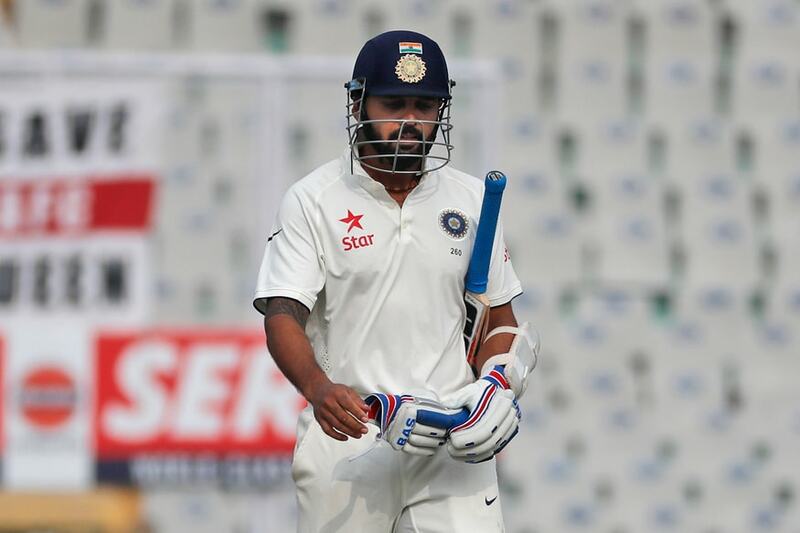 Or is Vijay not trusting his methods – being patient, wearing out the bowlers – completely? The toughness of the pitches over the last year has meant it’s not always possible to defend your way out of trouble. It’s this dilemma that is working against Vijay. He can perhaps take a leaf out of Cheteshwar Pujara’s book. Trust your methods no matter what. Or maybe he can just look within, for not long ago, he knew exactly what worked for him. It’s this in-between zone that Vijay has to get out of. He must do it soon, for the lifeline might not last long.